Joseph P Mendonça was born in the Azores Islands (1,500 miles off the coast of Portugal) on May 19, 1847; serving as a galley hand on a whaling vessel, he arrived in Hawaiʻi at about the age of 17 – he jumped ship. He met and lived with Mary Anehe Sylva (1870-1962.) She was part Hawaiian her father a British sea captain with at least some Portuguese ancestry. The couple later married in the 1920s and Mary Sylva became Mrs Mary A Mendonça. Mendonça became active the Annexation Party. On January 14, 1893, he became a member of the party’s Committee on Public safety, which soon afterward moved to overthrow the Hawaiian Kingdom. Mendonça had practical training as a carpenter and mason, and went into the construction trade. He also started to acquire land, lots of it. His leases and other acquisitions included property in Chinatown, the North Shore and the Windward side. They started with the herd with imported Angus cattle, purchased from James I Dowsett, one of the founders of the ranching industry in Hawai‘i. Horses, sheep, and goats rounded out the livestock assets. A couple years later, the ranch was incorporated, with JP Mendonça and C Bolte as the only shareholders. (MCBH) Mendonça was one of the most successful ranchers on the island. It seems he diverted his interest to Chinatown. On the North Shore, Mendonça had property less than a mile from the Oʻahu Land and Railway Company’s Mokuleʻia train station (it was also accessible by automobile;) the family had a beach house there. He also had an H-shaped, 2-story Mediterranean Revival Style house, designed by Robert Miller, on Judd Hillside Road on the slopes of Pu’u ‘Ualakaʻa in lower Manoa Valley (built in 1927.) Mendonça died in 1927. Here was where the spirits of the dead could be reunited with their ancestors. The path of the spirits of dead kinsmen always led westward; so as to return to the land of their ancestors. On every island there existed a prominent bluff pointing westward, bearing the name: “leap of the spirit” (leina-a-ka-uhane). The name marked the jumping-off place where the soul of the dead was believed to depart beyond the land of the living. 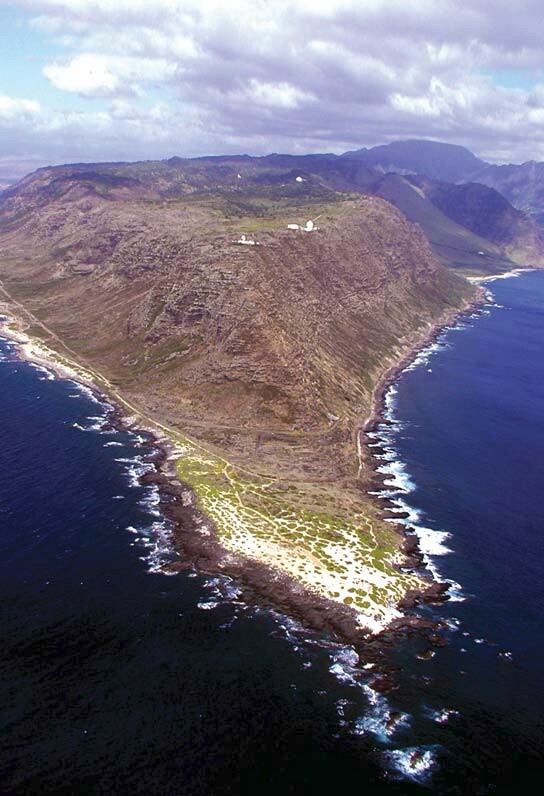 Kaʻena or Kaʻena Point (‘the heat’) is the westernmost tip of land on the island of Oʻahu. The point can be reached on foot from both the East (via Oʻahu’s North Shore / Mokuleʻia) and Southeast (via Waiʻanae Coast;) you cannot drive around the point. The volcano that created the Waiʻanae Mountain Range last erupted over 3-million years ago. On the narrow western point, the hard volcanic rock shows the mark of millennia of pounding waves – the carved sea cliﬀs of Mokuleʻia that rise above Kaʻena. Dunes such as these were once found on most of the main Hawaiian Islands, and on them developed ecosystems unique in the world. The intense sunlight, low rainfall, strong winds and salt spray created a challenging environment at Kaʻena. It is the site of one of the last intact dune ecosystems in the main Hawaiian Islands. In modern times (1983,) the State of Hawaiʻi designated Kaʻena Point as a Natural Area Reserve to protect nesting Laysan Albatrosses and wedge-tailed Shearwaters, Hawaiian monk seals and the fragile native strand vegetation that has been restored there. The reserve provides refuge and a nesting area for the Laysan albatross, and is a potential nesting site for the green sea turtle and Hawaiian monk seal. During the winter breeding season, humpback whales will frequent the waters surrounding the point. Nearly six feet of sand were lost due to vehicular erosion in less than ﬁve years. In response, motor-vehicles are now prohibited within the Reserve to help the dune ecosystem recover. Because dogs and rats have killed nesting seabirds, a nearly ½-mile long, 6½-foot high predator-proof fence was constructed following an existing roadbed and encloses the tip of the Kaʻena Point peninsula, a total of 59-acres. Three unlocked double-door gates allow access by people. After the fence was constructed, project personnel began to remove predatory animals from the reserve by using traps for larger animals and a combination of bait boxes and traps for rodents. One of the last few remaining and easily-accessible wilderness areas on Oʻahu, Kaʻena Point is also part of the State Park system. As part of the State Park, the Kaʻena Point Trail follows an old railroad bed and former dirt road that ran around the point. The trail leads to Kaʻena Point Natural Area Reserve. From the Waiʻanae side, the trailhead is at the end of the paved road in the Keawaʻula Section of Kaʻena Point State Park and follows the dirt roadway for 2.4 miles to Kaʻena Point Natural Area Reserve. From the Mokuleʻia side, the trailhead is at the end of the paved road and follows the dirt roadway for 2.5 miles. The image shows Kaʻena Point (DLNR.) In addition, I have included other related images in a folder of like name in the Photos section on my Facebook and Google+ pages. Kawaihāpai Ahupua’a is nestled between Keālia and Mokuleʻia ahupuaʻa in the Waialua District on the island of Oʻahu. West of Keālia is Kaʻena Ahupuaʻa. Kawaihāpai was known for its large loʻi (irrigated terraces) and sweet potato fields as well as excellent fishing grounds. The loʻi extended into Keālia, where small terraces at the foot of the pali (cliff) grew varieties of taro. Kamakau wrote that the loko iʻa of various sizes beautified the land, and that “a land with many fishponds was called a ‘fat’ land” (ʻāina momona.) The well-known loko iʻa of Waialua were Lokoea and ʻUkoʻa in the ahupuaʻa of Kawailoa. While Kamehameha I was living on Oʻahu, he worked in the fishponds on the island, including ʻUkoʻa in Waialua. After the death of Kinaʻu, daughter of Kamehameha I, all of her lands in Waialua were inherited by her infant daughter Victoria Kamaʻmalu. Although only nine years old at the time of the Māhele, Kamāmalu was the third largest land holder in the kingdom. However, she gave up all of her lands between the ahupua’a of Kamananui and Kaʻena to the government to satisfy the one third commutation requirement set by the Land Commission. Those who bought government lands were issued documents called grants or often referred to as Royal Patent Grants signed by Kamehameha III. These differed from the awards issued by the Land Commission. By the late-1800s, some of the heirs of the original Kawaihāpai landowners were selling land. By the mid-1920s, the Dillinghams owned land from Mokuleʻia to Kaʻena. Army use of land just south of the Oahu Railroad & Land Company (OR&L) railway in Mokuleʻia began in 1922 with the establishment of Camp Kawaihāpai as a communications station. 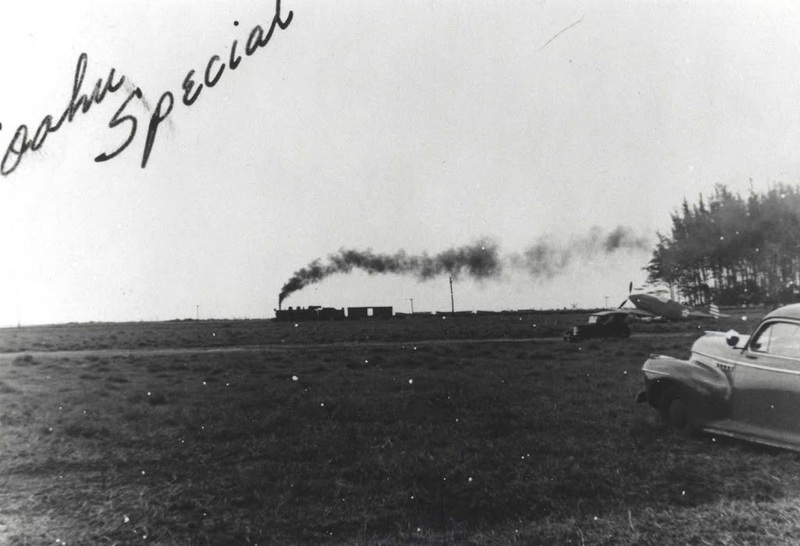 In the 1920s and 1930s, the site was also used as a deployment site for mobile coast artillery, which was transported by railroad. The US government acquired about 105-acres from Walter F. Dillingham, whose father, Benjamin F. Dillingham, had built Oʻahu Railway & Land Co. The military was looking for a site for an airfield. The area was originally called Kawaihāpai Military Reservation in 1927. By December 7, 1941, a fighter airstrip had been established on additional leased land and Mokuleʻia Airstrip had been established. P-40 aircraft were deployed at North Shore airstrips at Kahuku, Haleiwa and Mokuleʻia when the Pearl Harbor attack took place. At the outbreak of World War II, the area was re-designated Mokuleʻia Airfield and was expanded to accommodate bombers. Mokuleʻia Airfield was improved to a 9,000-foot by 75-foot paved runway, a crosswind runway and many aircraft revetments from 1942-1945. By the end of World War II, Mokuleʻia Airfield could handle B-29 bombers. In 1946, the U.S. Army acquired the additional 583 acres of leased land by condemnation. In late 1946, the US Army Air Force became the US Air Force by order of President Truman, so Mokuleʻia Airfield became an Air Force installation. In 1948, the airfield was inactivated and the area was renamed Dillingham Air Force Base in memory of Captain Henry Gaylord Dillingham, a B-29 pilot who was killed in action in Kawasaki, Japan, July 25, 1945. In the 1970s the state had examined the airfield’s potential as a reliever airport. The Defense Authorization Act of 1990 provided that the 67 acres of ceded land of old Camp Kawaihapai be transferred to the state after an agreement on future joint-use of the airfield was reached. It serves as a public and military use airport, operated by the Hawaiʻi Department of Transportation. The airport is primarily used for gliding and sky diving operations. Military operations consist largely of night operations for night vision device training. The image shows Dillingham’s OR&L Train going past Mokuleʻia Field, Oʻahu, ca 1942-1943. In addition, I have added other images in a folder of like kind in the Photos section on my Facebook and Google+ pages.